Two wheels created by the Women of Color Caucus and Social Justice Task Force of the Virginia Sexual and Domestic Violence Action Alliance. 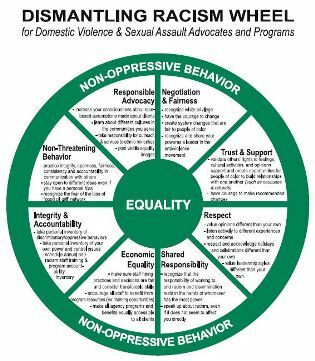 These wheels were created in the tradition of the Power and Control Wheel created by the Domestic Abuse Intervention Programs of Duluth, Minnesota. The Perpetuating Racism Wheel demonstrates how agencies might use power and control to perpetuate racism. The Dismangling Racism Wheel demonstrates how agencies can use principles of equaliaty to dismantle racism within their agencies. Who are the victims of elder abuse, neglect and exploitation? Does it surprise you to know that most elder mistreatment is committed, not by strangers, but by persons known to the victim, such as family members, caregivers and others in positions of trust? How is suspected abuse reported? And how can professionals work collaboratively to better address this complex issue? 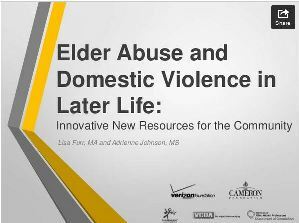 These questions and more are addressed in this archived webinar and power point presentation titled “Elder Abuse, Neglect and Exploitation.” Dr. Paula Kupstas and Lisa Furr of the Virginia Center on Aging presented on the topic; Dr. E. Ayn Welleford (Virginia Commission on Alzheimer’s Disease and Related Disorders/Virginia Commonwealth University) moderated the discussion. asked to share his or her experience, it becomes a matter of necessity to have a strategy in place to help that child.